A Thought Shared ....: Words of a Wise Man..
"We did not ask White Men to come here. 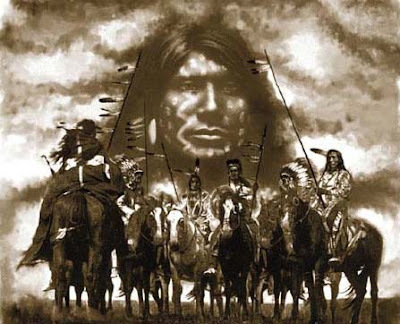 The Great Spirit gave us this country as a home. We do not interfere with you, and again you say, why do you not become civilized? We do not want your civilization. We would live as our fathers did, and their fathers before them." "A very great vision is needed and the man who has it must follow it as the eagle seeks the deepest blue of the sky. I was hostile to the white man. We preferred hunting to a life of idleness on our reservations. At times we did not get enough to eat and we were not allowed to hunt. All we wanted was peace and to be left alone. Soldiers came and destroyed our villages. Then Long Hair (Custer) came. They say we massacred him, but he would have done the same to us. Our first impulse was to escape but we were so hemmed in we had to fight." These are just a few words from the man known as Tashunkewitko to his people, the Oglala Lakota Sioux tribe, and Crazy Horse to the rest of the world. Born circa 1842, he was killed at Fort Robinson, Nebraska, in 1877.